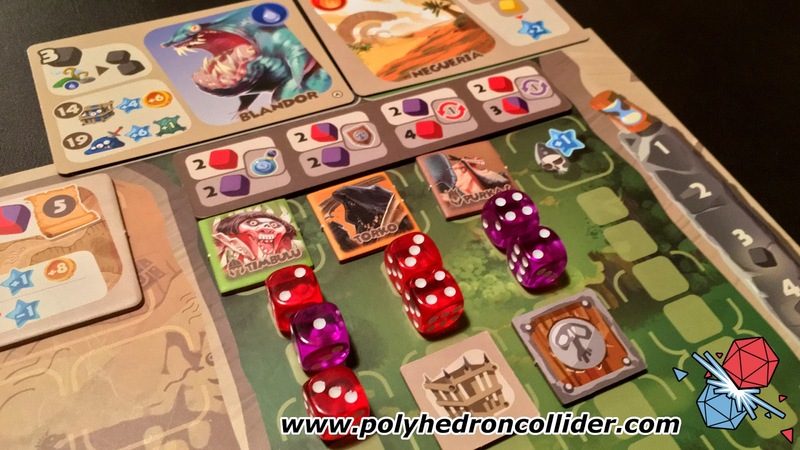 The core concept is that you will be rounding up a posse of heroes that will give you a pool of dice; you will then use these dice to grab locations on the board, worker placement style. Any of the spaces in the Citadel follows a traditional concept, allowing you to buy equipment or more heroes, but outside of the Citadel things are a little different. Here you will have to either fight monster, conquer lands or go on quests, and in these locations, not only will you be committing dice to the challenge but sending out your heroes to gain glory and hopefully not die in a bloody mess. We need to take a moment to go through monster battles work, because this is the linchpin of Monster Lands. First off you will have to commit to a lane, the lane designating not only turn order for fighting a monster but also restricting which dice you can commit and the immediate reward. You will then have to commit dice from your pool along with defence tokens and various buffs, such as potions and traps. 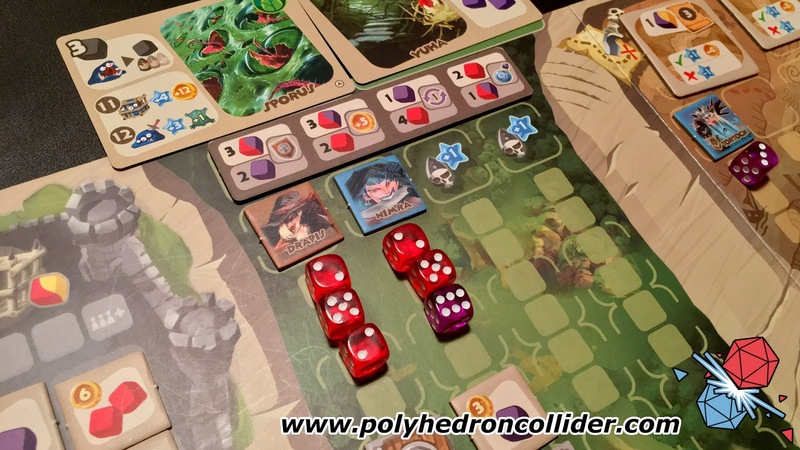 Once play gets to the fight itself you will have to roll high enough on your committed dice to beat the monster, providing you survive its initial attack. When taking any action, you use the results of the dice that are in the previous slots as well as your own. This means that equipment and heroes get cheaper to buy, and monsters get easier to kill—in theory. This really is the core mechanic of the Monster Lands, deciding where to commit your precious dice. Do you act first, piling in resources and giving you the first opportunity to kill a monster or your choice of hero? Or do you patiently wait your turn, relying on your opponent to have worn down the monster or not bought that hero you really wanted but knowing that you could then achieve your goals for fewer resources. Monster fights themselves can be deadly, and it should be made clear that your heroes can, and probably will, die. It's another aspect that means you have to carefully decide on where you place your heroes and dice. It also means that Monster Lands holds a couple of traps for the first-time player, that unfortunately can be rather game breaking. The main problem is that going into a monster fight unprepared is going to end up in the grisly death of your hero. This in itself isn't the end of the world as you may lose reputation but gain glory; the problem is this then puts you a little on the back foot. Have a couple of heroes die, and unless you can pull off some truly astounding manoeuvres out of the bag you might as well call it quits. The sad result of this is that there is the potential for a runaway leader but after learning this lesson the hard way you will go into the next game wiser and last a lot longer, but that first game experience is going to turn some players away. You are gambling on the monster rolling low, gambling on your hero rolling high and gambling on the result of the previous fighter either knocking the monster down a peg or two, or winning the job so you can conquer the lands. At the higher player counts, the order in which players take actions can significantly alter your strategy as you evaluate what other players may be able to achieve with the dice and resources they have committed and placing a cheeky die in the last space can reap some huge rewards. And just like real gambling there is an undeniably thrill from watching the proceedings unfold. 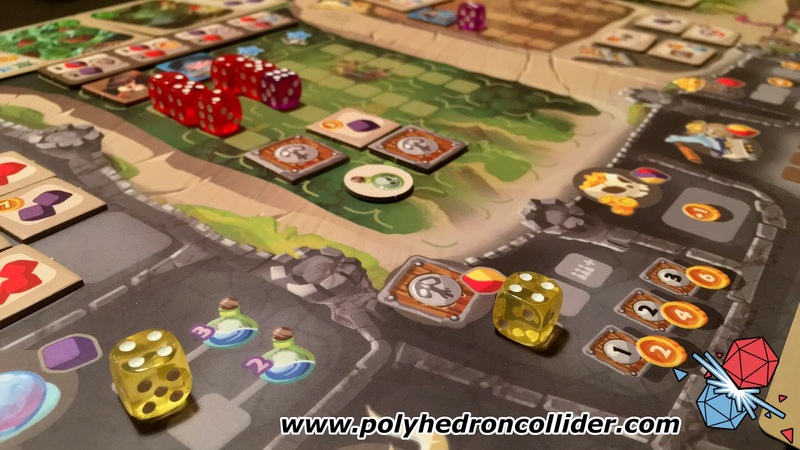 Its tense, exciting and thoroughly fun as you hang on to the result of every die roll. 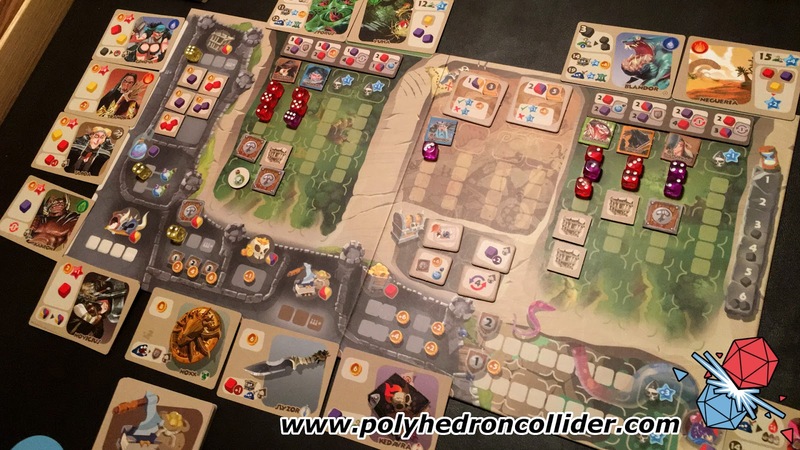 Monster lands is certainly a lot heavier than it first looks, with a wealth of options at your disposal every turn. 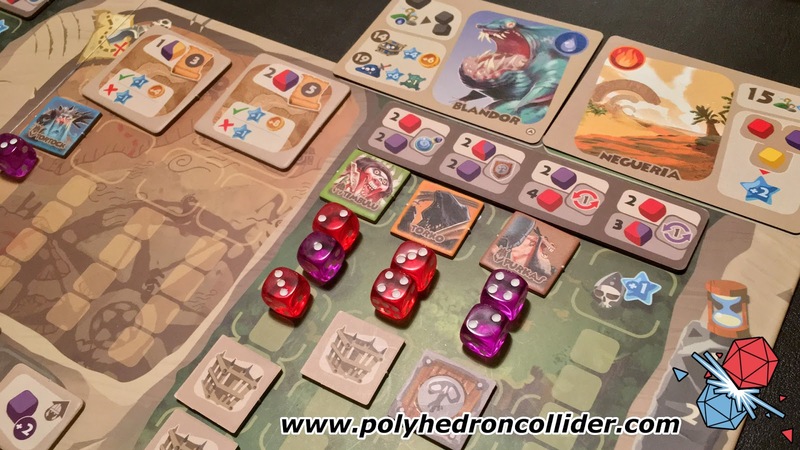 It's also deceiving because what may appear to be a straightforward dice placement game is in fact a game of gambling and will turn off the heavy euro game who hate the "choose first then roll" aspect that is very much at the core of Monster Lands. But to me that is what makes this game so much fun. Monster Lands is on Kickstarter now.